This recipe for pumpkin muffins was (mildly) adapted from the Joy of Cooking. It may be more correct to even say it was just barely adapted, and only by accident. By accident because it turns out it is very hard to bake pumpkin muffins (or anything) while you are wearing a Freddy Krueger glove, so many of the suggested seasonings — ginger, nutmeg, salt, love — were omitted in the video recipe. 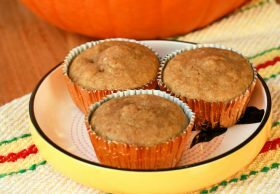 These still turned out to be good pumpkin muffins with a nice, soft texture and plenty of pumpkin flavor! Check out this method to make pumpkin puree if you want to get extra homemade. 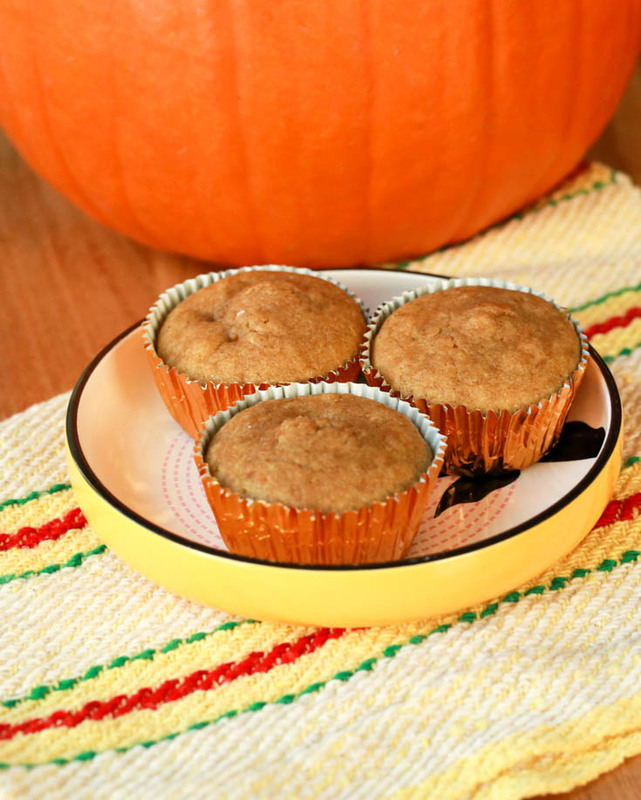 And for a sweeter treat, try my pumpkin bread or pumpkin cupcakes recipe. Watch the extra-spooky Recipe Video on YouTube! Whisk flour, sugar, baking powder and cinnamon together in a large bowl. Mix milk, oil, and eggs together in a smaller container. Add wet to dry and then add pumpkin. Mix quickly until everything is wet. Bake 15 minutes or until a a toothpick inserted into a muffin comes out clean. I think there’s a typo here… 12 cup sugar? My hubby made these tonight and they’re super yummy! We used 1/2 cup sugar (we guessed that’s what “12 cup sugar” meant, lol). We *did* mix the sugar with the wet ingredients instead of the dry (since it’s a “wet” ingredient). Thanks for posting the recipe on the perfect day; we went to the pumpkin patch with our little ones today and this was a great way to end our excursion! Haha! Yes, I fixed the typo 😉 Glad you enjoyed the muffins, Rebekah! I will have to make these pumpkin muffins for my Halloween party next week! Oh man. This video was my favorite of yours so far. Nightmare was one of the first movies I ever saw – yes, my parents were very carefree – and you really nailed him. The idea of Wes Craven (RIP) making an entire movie where Freddy tries out culinary school is an idea that makes me so happy to think about hahaha. Loved this so much. Thank you. 1. If I do my own puree how much does it yield from an average pie pumpkin? I’ll probably need to freeze whatever I don’t need for the muffins. 2. I noticed here, and then checked your other pumpkin baking recipes, you use oil as the fat w/pumpkin bread also but butter w/the pumpkin cupcakes–I’m used to seeing butter in the (few) baking recipes I’ve tried, including yours. Is there a particular reason for oil specifically w/pumpkin recipes or some pumpkin recipes? 3. If the “glove” prevented from adding spices you normally would, would you have gone the allspice/clove/nutmeg route of the cupcakes or the vanilla/ginger/clove route of the bread? By ginger do you mean fresh grated off the root or is there something in a jar I should buy? 4. Would it be OK to substitute brown sugar in this recipe or does that do bad things to muffins? I have no idea–this is my first time trying to make them. If I use brown sugar instead, should it be 1:1 w/white? 2. Oil is often used in cakes and quick bread that have a lot of “extras” like grated carrots, or zucchini, or nuts/raisins. These types of cakes/breads/muffins are meant to be a little denser, moister than a cakes or cupcakes made with butter. When baking with butter, the butter and sugar are creamed together first to add air into the batter and increase the leavening power. 3. Most baking recipes that call for ginger mean the dried, ground ginger you get in the dried spices aisle. I think for these muffins, a teaspoon of ground cloves and ginger would be great! And a teaspoon of vanilla is welcome in any sweet baked goods. 4. Brown sugar adds flavor and makes baked goods more moist. I think it would work fine in this recipe! sub 1:1 but pack the brown sugar into the measuring cup to get an accurate measure. When you dump it out, it should retain the shape of the measuring cup at first.